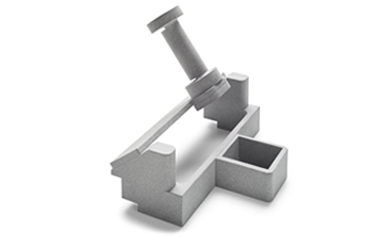 This assembly tool used in the production of HP Jet Fusion 3D Printers has been designed to hold an anemometer perpendicular to the flow of air to gather consistent air speed values from the blowing stations of HP 3D printers. By monitoring the amount of air that flows through the blowing nozzles, we can detect obstructions in the air channels as well as defective fans. It can handle geometrical tolerances of about +/- 0.5 mm, but must be strong and robust enough to maintain its functionality despite external factors such as impacts, intensive usage, and operator learning curves. The anemometer support was previously made from a combination of different parts produced with CNC machining. Assembly consolidation: Multiple assembly parts were reduced to one single part with a design for HP Multi Jet Fusion, which helped reduce variability, increase repeatability, and help reduce assembly costs and potential errors. Ease of use: To enhance tool operation, ergonomic features were easily added at a low cost. 1Cost reduction percentage calculated by comparing the cost of part manufactured using HP Multi Jet Fusion technology at $59 versus the cost of same CNC machined part at $325. 2Weight reduction percentage calculated by comparing the weight of part manufactured using HP Multi Jet Fusion technology at 178 g versus the weight of same CNC machined part at 473 g.